Goteo, spreading social and open innovation. GOTEO WORKSHOP offers theoretical and practical information about the different kinds of collective financing available, helping participants in a dynamic and practical way to get a handle on crowdfunding as a strategy both for financing their projects as well as promoting and generating community. a) Discussion of the exhaustive research carried out by Platoniq on different kinds of platforms and processes, differentiating micro-financing, collective financing (crowdfunding) and p2p loans. 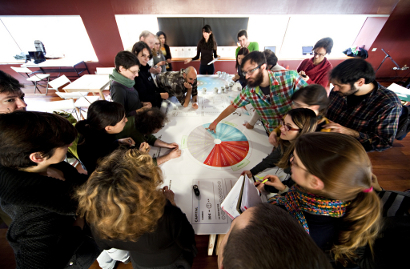 b) Hands on session in which we experiment with collective financing through a series of real projects. This part represents—in analogic mode—how a crowdfunding platform works through dynamic participation. If you'd like us to adapt a crowdfunding workshop for your organization, community, or event, contact us. Thanks to our workshops, participants can get an idea of key issues, how can be the criteria for campaigns evaluations and how they can make projects more attractive. To that end, we have developed tools that participants can use to measure the valuation of initiatives based on the level of innovation, level of proximity, coherence, etc. Another objective of this participatory dynamic is to use workshops to help the attendees figure out the best way to present a project online and give it the widest possibilites for success. Goteo consults with the producers as they work on their project, for which it's absolutely necessary to have a clear idea of the motivations of possible donors.